Click here for my 2009 prize donation. My prize donation in 2010 was a $50 gift voucher for my Made by Mim shop. 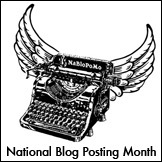 I’ve been taking part in the National Blog Posting Month project since 2007. It’s a great way to get kick-started (or nudged back into) a regular writing habit. You can explore the relevant post archive using the NaBloPoMo tag.